Seeing this post on Uncrate today, I had one of those “Well when I was in college” flashbacks. Like "When I was in college we wore black pants, drank jungle juice from a red cup for $5 all night and took our front door of it's hinges to play beer pong." Boy, have I come a long way. 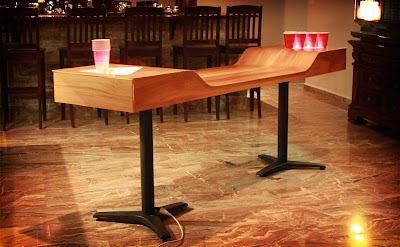 Readers, let me introduce you to the $750 Custom Beer Pong Table. I know what you are thinking – why would I spent that much on a custom beer pong table? This table says I’ve got a serious side, but I like to party. This table is respectable enough if you wanted to use it as a dining room table when your in-laws visited, they wouldn’t know that it you use it for weekend keggers. AND This table is a more chic version of the door a door. You can stay warm and still play beer pong. Oh and the LED lit triangles? Classy.